The invite for this trip came in the same way most important information from my father comes, slipped casually into the end of another unrelated conversation. There wasn’t much convincing to be done. Retracing my fathers steps, by his side, to the top of Mt. Izta and Pico de Orizaba, like he did when he was my age? I was on board from the start. But he had work to do. I’m in decent enough shape but have rarely tested my lungs above 11,000ft, and my dad is no longer the baby faced 27-year-old from the photo in the study. Summiting all three of these peaks was going to be anything but easy. None the less we all met up in Mexico City in high spirits for a few days of acclimating and bonding. My father wasn’t the only old geezer on this trip, he had recruited two other local mountain men for the excursion. Phil, a retired banker and avid hiker, and Tony, a carpenter and former amateur boxer in his native Australia, were also in their mid (to late) 60s. We were eventually join by Artem, another hiker in our guide group.There was a hue of realism about the camp. Tony was coming off a shoulder surgery and a minor knee injury, and with everyone living at more or less sea level we were all worried about getting used to the altitude. 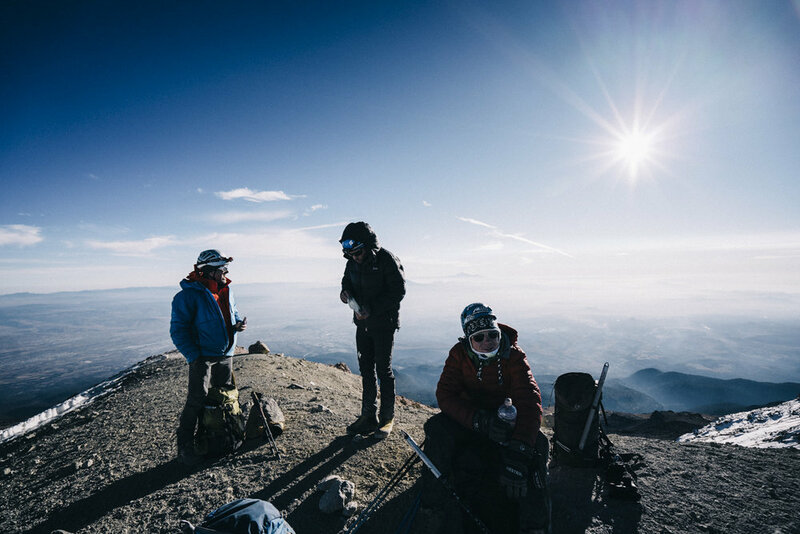 We all had our personal goals, “I just want to make 17,000ft,” “No long term injuries, please,” “I’ll be happy as long as they don't need a helicopter to get me off the mountain.” I only had eyes for the 18,491ft summit of Pico de Orizaba. After a few days of beers, tacos, and witnessing protests over gas prices in Mexico City we head off to La Malinche. We ate cactus tacos at a taqueria at the trail head (how very mexico) and spent the night at about 10,000ft in a small cabin, I regret not taking advantage of the hot water and plumbing, which soon would become a rarity. The next day proved to be quite the warm up hike, at 14,636ft the extinct volcano would be the tallest mountain I have ever summited to that point, but the whole gang was excited to be stretching our legs. First day on the hill, the crew starts up La Malinche amongst the trees. Having all trained for the most part on our own it was interesting to see how each member of the group was performing at this early stage. For the most part everyone looked strong, the altitude had us breathing heavier than normal but we were full of energy. My dad took off that first morning on a mission. 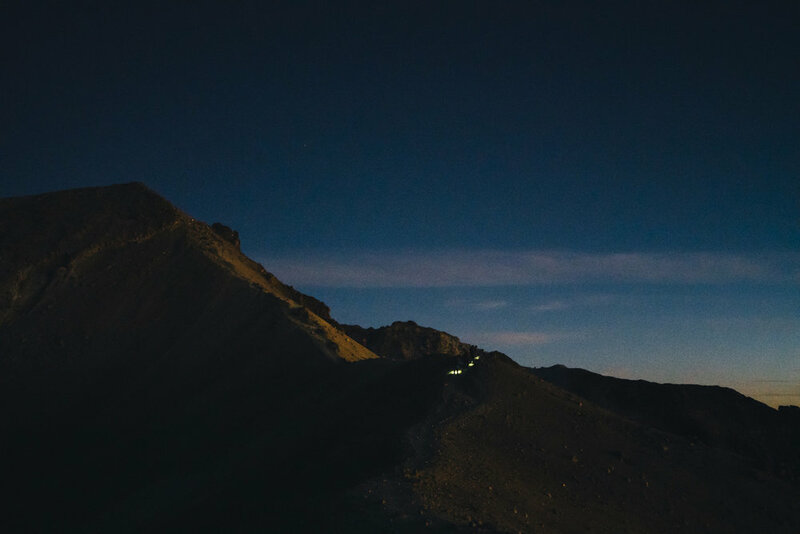 Setting his typical reliable pace, he damn near whistled his way to the top of La Malinche. I was proud of him, I think he was too, and my hopes for his chances over the next few days grew. Tony was struggling. Slogging along behind the group is not his normal place, he's known as the strongest hiker in my father’s usual troop. His shoulder and knee injuries had thrown a wrench in his training regime for this trip and it was clear that he wasn’t in the shape he wanted to be in. It had been about 6 years since I hiked with Tony, but anyone cold tell he wasn’t his usual self. But, Tony is a lot of things, a quitter isn’t one of them. My dad, all smiles on the summit. He made it to the top of La Malinche “tortoise and the hair style” as he said. The whole group sat on the summit, all laughs and smiles, and looked out over the plateau. Our todo list was scattered about the horizon. Far to the west sat Mt. Izta and Popo, we were to start another warm up hike from the saddle between the two the next morning. To the east was Pico De Orizaba. The peak juts out of the horizon like a whale jumping from the ocean. I made a note that at this time in 5 days, hopefully, we would be just making our descent down the southern face. That name stuck with me. Los Solovinos. I thought about why each of us decided to go on this trip. I was seeking quality time with my father, a chance to take a glimpse into his past. The others perhaps had a point to prove, that their 60+ year old bodies were up for the challenge. Our guide Chris run’s up and down these mountains for fun. The challenge is gone yet he still returns, as a pilgrimage it seems. We have all come with our own reasons to attempt the same mission. And while we talk together in the end it is all up to you to push on and challenge the mountain as it challenges you. There is always a sense of solitude on the mountain. Accountability. We are alone up there. Los Solovinos. I made it down pretty quick, apparently, and I unloaded my pack as the others trickled in behind me to enjoy a victory beer and a house special at the local taqueria. Phil, Tony, and my dad had been walking together and walked up with broad smiles in good cheer. Phil had an announcement to make. From right to left, Chris (local guide), Michael (Me), Phil, Artem, Marty (my father), Joe (American guide), and Tony. Chris helps prepare dinner in our lodge, which a great view of Mt. Popo in the distance. The temperature fell as the tension in the room rose the night before our hike up Mt. Iztaaccihuatl. Our camp style dinner was followed by an impromptu strategy session to make a plan for the following day’s ascent. We were already looking at less than 4 hours of sleep for the night when concerns were raised, and as the minutes ticked past the confidence of my dad and the other elder statesman of the team was wavering. Mt. Izta is not an easy day of climbing. While it isn’t the tallest peak on our trip it presents some unique difficulties. There is a particularly technical stretch of climbing in the middle of the hike which must be done in the dark. The quick altitude gain early on means you must spend most of your day at a very high altitude while you traverse a narrow ridge, a glacier field, and several false summits on your way to the top. It was projected to be a 14-16 hour day with about 5,500ft of elevation gain. “My main concern is that I will overexert myself and ruin my shot at Pico De Orizaba,” said my father after assessing the situation. “I would love to get up Izta again, but…” He trailed off, but I knew what that but meant; he didn't want to slow down the group and ruin the summit for the others. This seemed to be the consensus from The Chivos. Two groups had established themselves: there was my father and the Old Goats, and then there was myself and Artem, a Russian man living in the Bay Area that was part of our guide group. Artem and I were the stronger hikers and were confident we could do both of the remaining summits, were as for The Goats it was looking as if they would have to choose between Izta and Orizaba. 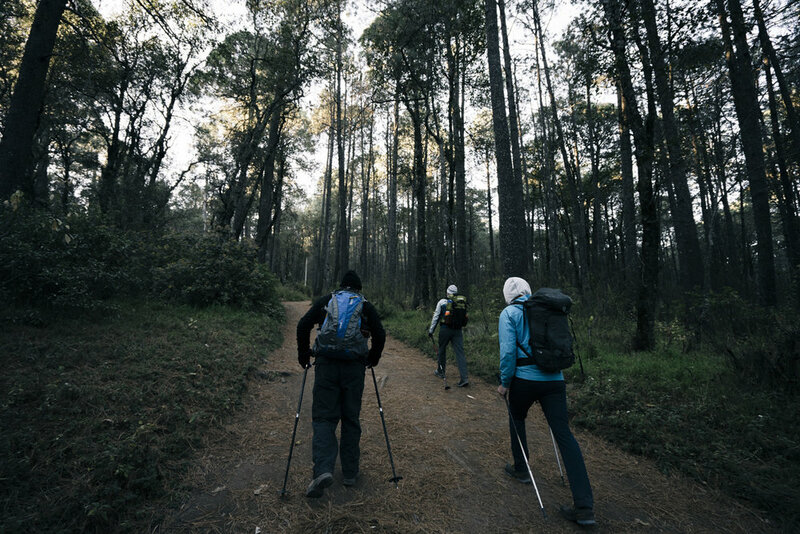 Both are very challenging hikes, but one could argue that Pico De Orizaba, though much higher, is an easier hike that would be made on 2 days rest. Volcanic gas rises from Mt. Popocatepetl, The Warrior, at sunset. The plan settled as follows: Artem and I would fly out of the gates in the AM, taking the American guide Joe with us to make a run fro the summit. 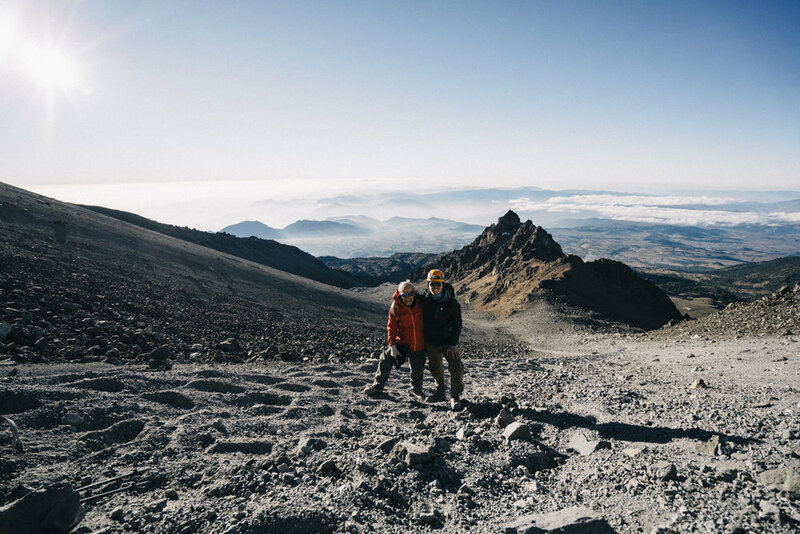 The Chivos, my dad, Phil, and Tony, would stick with our local guide, Chris, moving at their own pace with a goal of making it to about 15,500ft, helping them acclimate to the high altitudes so they could make a strong attempt at Pico De Orizaba in 3 days. When that was agreed upon we finished preparing our packs and all crawled into our bunks in the old hikers lodge to take advantage of the few ours of sleep we had left. It would be a very restless night of sleep for me. I was excited, anxious, and nervous even. The “kid on christmas morning” mixed with an element of danger was too much for me and I lay awake for nearly the entire evening. The specific thoughts from that evening are a blur; my notebook is an scattered mess of illegible scribblings. I tossed and turned until I heard my alarm to wake up. I has mustered, at the most, about 45 minutes of sleep. Hiking by moonlight, mostly. It is hard to take photos while shivering violently. Before I knew it I was out of my sleeping bag, into my boots, and headed up the trail. The first thing that scares people about alpine climbing is early, cold starts to long, tiresome days, but this is where the real magic is. Early mornings at high altitude are surreal. The world is a mysterious haze, illuminated only by the dim glow of the moon and the light of your head lamp as time melts away into the adrenaline high keeping you abuzz with excitement. Your mind slides into a flow state, your focus is on nothing but the ground in front of you, taking one step at a time. You are tired. You are cold. But you are alive. The first section is a breeze. Joe (our guide), Artem, and I blaze up the trail before we are met up with Thomas, a German in his 30s who had started behind us. Thomas liked his chances at the top and pushed up to join us. The four of us marched quickly through the dark Mexican morning. It is a different kind of cold when you are at elevation. Even while bundled in layers and layers of cold weather gear the moments you are free of cold’s grasp are fleeting. The dull humming of numbness stretches from your toes to your finger tips and is interrupted only by a sharp breeze that sends bone rattling shivers down your spine. With the sun still hours from peeking above the horizon the only way to fight the cold is to move. As long as you are moving and working you can generate just enough body heat to keep functioning. Stopping for a drink of water, pausing for only 15 or 20 seconds, is enough for the cold to seep back into your core. You are tired. You are cold. But you are alive. First light on Mt. Izta made for a great view of Mt. Popo in the distance. When the sun began to creep over the horizon when we were nearing 16,000ft. The world around us slowly began to glow with warmth as the mountains around me revealed their beauty. The blackness of the sky gave way to a soft gradient, a deep purple trickled into the hot orange of the new sun. We had stopped to rest at the first false summit which looked down into a glacial valley unlike anything I had ever seen. A sprawling ice blanket of white covered the steep rocky bowl. Several hundred feet bellow there was an ice covered lake, frozen in time, nestled into the bosom of the mountain they call “The White Woman.” I felt at the same time alone, small, and ever so connected to the greater whole of our planet. Despite the soreness in my already heavy legs, despite the still bitter cold, despite the morning light revealing the miles of glacier and rugged trail that still lay ahead; the smile would not leave my face. For the first time I felt like I was a mountaineer. The route to the summit takes us over the Ayolotepito Glacier. This was our first sight of the summit since the previous day. For the record, I think my dad could have made it to the summit of Mt. Izta. We set quite a pace to make it to the top, we were back to the trail head in just about 10 hours, but he could of made the climb at his own pace. Even though he didn’t make the summit with me it felt good to see his face when we showed up so far ahead of schedule. I was happy to have made him proud, but already my sights were set on Pico De Orizaba. Already I had made a pledge to myself, I wouldn’t go it alone next time. We would reach the summit together. Artem, Joe, and Thomas (right before he puked) at the summit of Mt. Iztaccihuatl. Learning the hard way that “headed back down” is only half way home. For most people, being tossed around in the back of a beat up 4x4 rattling over a dirt road to nowhere at 2:30am in Mexico is basically a worst case scenario. I watched my breath fog the window and reminded myself that I had volunteered for this. Getting ready for a long, cold day. The car was to drop us off at the trailhead for Pico De Orizaba at 14,000ft so we could start the climb to the top of Mexico at 18,491ft. Another short night of sleep before a big hike has us all groggy but excited for the day ahead. In the car is myself, Artem, Phil, my dad, and two local Mexican guides. Tony stayed in nearby Puebla, his recovering knee had proven to be too much to overcome before the Orizaba attempt. Our guide Joe stayed back as well; bedridden by a bout with Montezuma’s Revenge. The remaining crew agreed to stay together, breaking up only if someone needed to turn back. There was only one thing on our minds as we all double checked our packs: it was cold. Damn cold. We would later estimate temperatures to be, at least, at or bellow 0 (that is Fahrenheit, by the way). This night, the coldest night in a cold patch of days, was also unusually windy. Quite often a gust would pick up, forcing you to halt to keep balance, and the cold would cut right through your clothing as if it wasn’t even their. In the first 15 minutes we would stop 3 times to put on extra layers. By 3am each hiker was wearing every layer of clothing we had and still struggling to stay warm even while moving. As my movement become more repetitive and mechanical my thoughts began to wander. This often happens on long hikes such as this one. There comes a point of exertion where your mind separates itself from the physical world you are experiencing, the “runner’s high” we have all heard of. As much as these mountains I am climbing are about the spirit of adventure, experiencing new things, and living great stories they are equally about this thrilling high. Sunrise on Pico De Orizaba at 16,500ft. My tired mind slowly slipped beyond my control. The chilling sting in my hands faded into my trance like state; I felt above the cold. My procession to the summit had obscured my sense of both time and space. It was nirvana. A few minutes short of 5am Phil decided he had had enough. He was struggling to keep the pace, doubting if he could keep this up for the estimated 8 more hours to the summit. In the end it was the cold that did him in. Topping out at about 16,200ft, Phil and our new Mexican guide turned back down the mountain to rest in a small refugio, climbers hut, we had passed about an hour ago to try and warm up. We bid each other good luck and the 4 of us continued on up the trail. This route up the southern face of Pico De Orizaba was chose as the most direct path to the summit. It is a stoney mess of switchbacks through loose gravel, many sections require scrambling with hands and feet over the rough volcanic rock. It was not easy work. My father, however, was looking very strong. He was close on the heel’s of Chris, our faithful Mexican guide, as they set a safe but formidable pace. I couldn’t help but get excited for him, at that early hour I was full of confidence that he would make it to the top. The sun was nearing the horizon and the salvation of warmth was on its way when my father asked if we could take a break to catch our breath. Our guide explained that we were close to a good place to stop, but my dad said he needed to stop now. We set down our packs and reached for our waters to enjoy the first rays of the day’s warmth. “Michael, I think your dad is having a problem,” said Artem in a cautious voice. My dad was sitting down now and breathing very heavily. Sweat was dripping down his face as he fought to catch his breath. He looked panicked and scared. I know I was. He was nauseous when he stood so he had to sit down, but sitting down made him dizzy. Being Dizzy on a 45 degree slope is no joke. He told me his head felt too hot but his hands were painfully cold and couldn’t get warm. Food and water were the last thing on his mind, but he needed them desperately. So he choked down sips of water and a few bites of my PB&J between heavy labored breaths. The next 10 minutes felt like an hour. It was clear my dad had gotten a pretty quick and serious bit of altitude sickness. The only cure was for him to go down. When he finally caught his breath, we decided to wait another 10 minute to see if the dizziness and nausea went away. Chris and Artem both did push ups to keep warm while we waited. I’ll never forget the look in his eyes, it told me he had made up his mind. Our attempt at Orizaba would be ending at 16,700ft. Partly out of caution and partly in honor of a promise to my mom, I had knew I had to assist my father down the mountain. We switched the packs around to give me some extra weight from my fathers bag, wished Chris and Artem good luck on their quest to the top (the would summit around 12:30pm) and started our descent. We scrambled over a tricky section of rocks to get to a scree field, a steep slope with loose gravel that makes for a tough climb but a quick and smooth descent. Was able to snap a quick photo just before we decided to turn back. If I am being honest with myself, the main reason I said yes to this trip is that I wanted to learn something. Whether I was by looking inward or outward that I hoped to learn more about the universe I don't know. Perhaps I hoped there was a lesson in manhood to be taught be reliving this journey from my father’s younger days. Hadn’t he experienced some grand realization on his right of passage? As we slid down mini rock slides in the scree I couldn’t help but feel incomplete, cheated even. Not cheated of the summit, but cheated of my big lesson. This story was to finish without a moral. He was right, my mom loved this one. And just like that, I saw it. He was headed a different direction and a slightly different dust covered mountain side in Mexico, but the smile on my father’s face was the same one that sat in a frame on a shelf for my entire life. The rest of the way down we shares stories from other trips, other successes and other failures. We made plans to going fishing in British Columbia in the summer. We agree that the hike from the family cabin to Yosemite Valley couldn’t be more than 120 miles and would make a great through hike one of these days. All of the fears, worries, and doubts from earlier were forgotten. We both smiled ear to ear, looking forward to the next adventure. Michael Weybret is the founder of Do Something Cool and acting editor-n-chief. Born and raised in California, Michael now lives on the road exploring the US in search for untold stories, hidden gems, and cinnamon rolls. In addition to his work for DSC Michael is a filmmaker, photographer, and writer.